If AGM’s frighten you off and you didn’t attend this year’s meeting you missed a treat. It was a chilly morning and I was looking forward to a relaxing day being entertained by the two speakers Linda Pardoe and Jan Hassard. From past experience I knew the business part of the day would be completed quickly and this was so. As there were a few changes to the committee these hardworking people were introduced to us and it was nice to be able to put a face to the name. 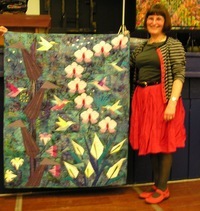 The morning speaker, Linda Pardoe is well known to many members having quilted for 30 years in the Exeter area. Linda showed us illustrations of her work and the sources of her inspiration much of which comes from Art Deco designs and architecture. After time for a relaxing lunch and retail therapy it was time for our second speaker Jan Hassard. This time we were treated to Jan’s own quilts, definitely not for the faint hearted, these are full of colour and vibrancy. 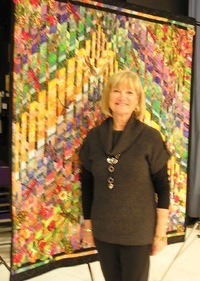 Her use of the colour palette, very often with black, makes her quilts come alive and the shapes and curves give illusion and movement on a grand scale. Both Linda and Jan are inspirational and it was a wonderful treat to be able to share the enthusiasm and enjoyment these clever ladies have for their art.